WAGHENAER - Caerte der Noordt cufte va Engelandt, beginnende van Robinhodes baij tot Coket Eijlandt. . . .
WAGHENAER, L. J. - Caerte der Noordt cufte va Engelandt, beginnende van Robinhodes baij tot Coket Eijlandt. . . .
Caerte der Noordt cufte va Engelandt, beginnende van Robinhodes baij tot Coket Eijlandt. . . . - WAGHENAER, L. J. Title : Caerte der Noordt cufte va Engelandt, beginnende van Robinhodes baij tot Coket Eijlandt. . . .. Description :A very early Dutch text edition of this detailed chart of the northern coast of England. Mileage cartouche has no Latin captures. West to the top.Decorated by a colourful title cartouche and scale cartouche, one compass rose, several vessels. Chart from the first Dutch text edition of this landmark contribution to the science of navigation. 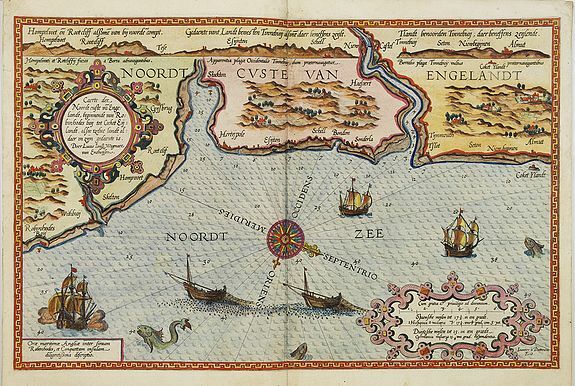 Waghenaer's own personal experiences as a pilot along European coasts were used to compile the Spiegel der Zeevaerdt, the first edition of which was published in Dutch at Leyden in 1584/85 by the house of Plantin. Although advertised as published in 1584 according to Koeman this edition is more likely printed in 1585. Condition : Paper slightly age-toned. Some very minor paper thinning at center fold. Some smudging on left and right bottom margin. Else good condition.